In light of the News of the World sting, exposing Sarah Ferguson’s selling access to her ex-husband, Prince Andrew, I have discovered two ardent camps of Fergie friends and foes. There seem to be opposing views about the Duchess on York on either side of the Atlantic. My British in-laws think that she has consistently tarnished the Royal Family’s good name, whereas my American brother thinks that the royals shoved her aside after her divorce from Prince Andrew. …beyond hoodwinking businessmen into giving her money to arrange meetings with her ex-husband. My only question is whether Prince Andrew was as ignorant about the scheme as they claim. For the first time, I am not participating in an election in which I am eligible to vote. I blame the ash cloud. And of course, it’s an historic British election that I was jubilantly excited to vote in, as only die-hard voters are. After years of casting my ballot in every American election that came up, from local to federal, electing judges, district councillors, and other posts that wouldn’t draw most voters to the polls, I miss the one that people around the world are talking about. I have always been an election enthusiast, so I am greatly bothered to be sitting on the sidelines of this one. It’s the closest election in more than 30 years, and certainly the most interesting one in my two-year-long lifetime as a British citizen. My postal ballot never arrived. That is most likely the fault of the havoc wreaked on the mail service by the Icelandic ash cloud last month. Maybe it’s time to put the ballots online. That measure would get my vote. 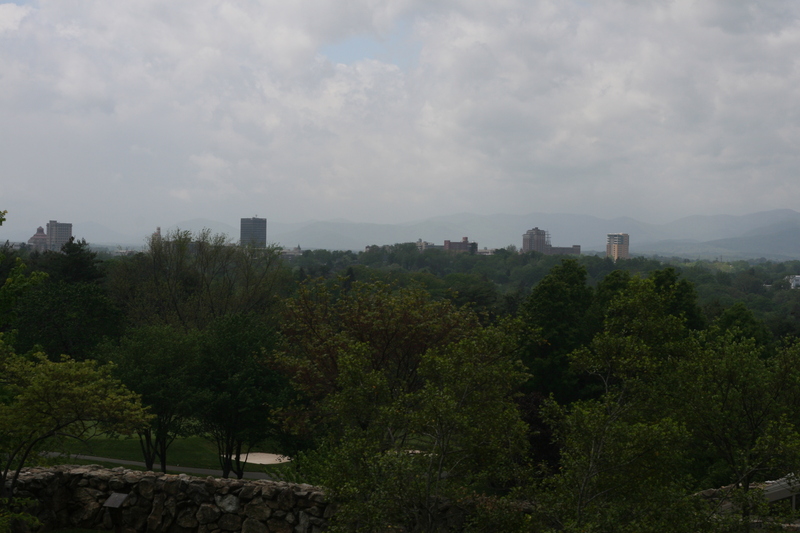 Just five days after the First Family left Asheville, we drove to the charming North Carolina town. While we missed out on the Blue Ridge Mountain hike that the Obamas apparently took, we managed to walk the town’s hilly streets, admire the mountain view, and watch an impressive game of hacky sack in Pritchard Park. It felt like a small slice of San Francisco’s Haight-Ashbury — and not just because of the footbag kicking game. Young people lounging in the park, strumming guitars and chatting, give the city a laid-back feel. Art studios dappled throughout Asheville showcase paintings, jewelry and other offerings from local artists. 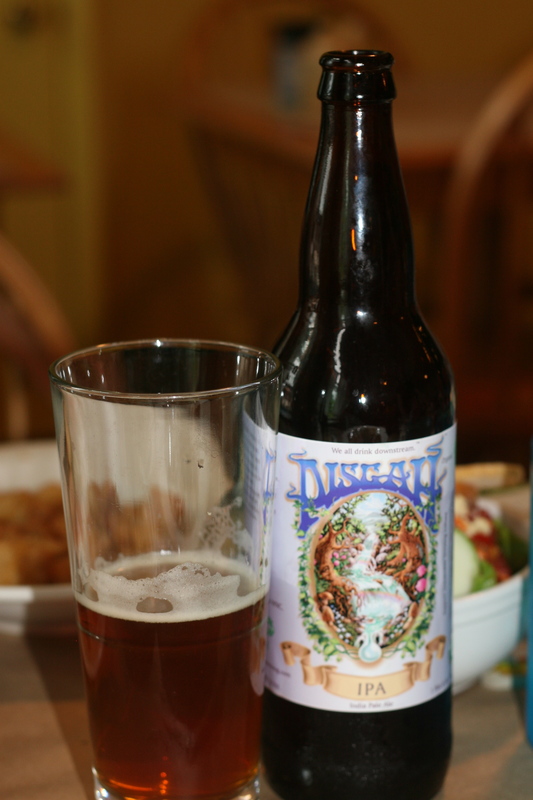 I do not believe that any Asheville micro breweries decided to brew a beer in our honor, as one did to mark the President’s visit. But my husband did enjoy his taste of a local beer. Our waitress looked downright thrilled when he ordered an Asheville, rather than imported, drink (and boy was it strong). Thanks to the early May sunshine and wide sidewalks, we were able to walk from one end of town to the other. We bought treats from the Marble Slab Creamery, which served massive, made-to-order tubs of homemade ice cream. The small, independent restaurants were a welcome departure from the chains we tend to frequent. Locally grown, organic food seemed to be the pride of these places. I liked the Fried Green Tomato Napoleon at the Early Girl Eatery, a cheery diner tucked down a narrow side street. While we didn’t stay at the posh Grove Park Inn, where the Obamas stayed, we did stop by. We asked the host standing guard outside the famed Sunset Terrace, where the Obamas are said to have dined, if we could sit and drink coffee with our two toddlers. He responded that he would like to invite us to sit inside instead, in a dark and empty area. It would appear that toddlers are not encouraged admire the breathtaking mountain view from the Sunset Terrace. But youngsters seem to be welcome almost everywhere else in Asheville. 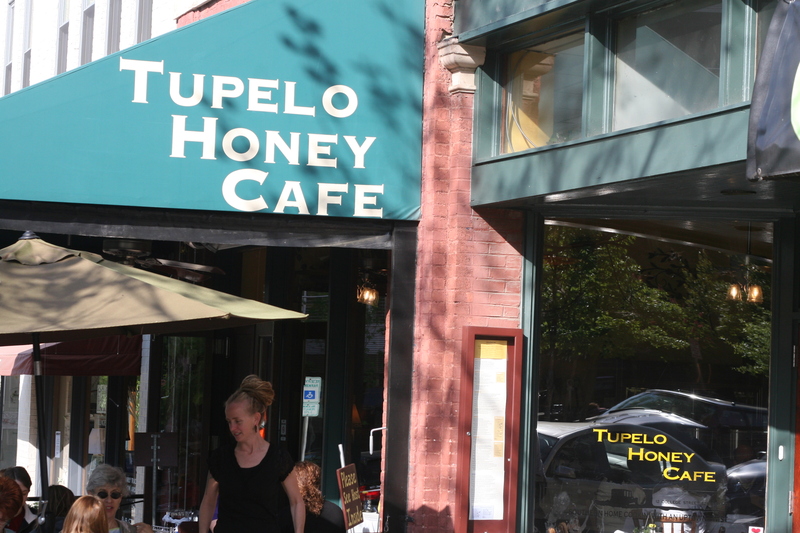 When we visited the highly recommended brunch spot, Tupelo Honey Cafe, the waitresses and patrons laughed and smiled as our kids threw crayons and raisins. I loved the goat cheese grits that came along with the special omelet. And of course, I bought a jar of Tupelo Honey as a souvenir. We realized that Asheville is a lovely town, filled with friendly people, charming local restaurants, shops, and art studios. It is certainly worth a visit if you’re in the South, and if you’re the President, it is worth flying to from DC. Especially if you get a beer named after you.